by Vance Morton* - compiled from national news reports. After learning of Pope Benedict XVI’s announcement to resign as the head of the Roman Catholic Church, Bishop Mike Lowry, episcopal leader of the Central Texas Conference, called the people of the Central Texas Conference to prayer as the Roman Catholic Church go through a time of transition not experienced since 1415. 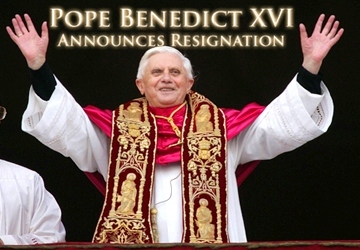 Pope Benedict XVI announced Monday, Feb. 11, that he would resign his position as the head of the Roman Catholic Church effective Feb. 28, shocking the Christian world and even many close to him. He has led the Church since 2005. In his announcement to a meeting of Vatican cardinals, he explained his decision to retire was due to his advanced age and diminished strength. Benedict, the 265th Pontiff, will be the first leader of the Church to step down voluntarily in almost six centuries and his announcement sets the stage for a conclave to elect a new pope before the end of March. Vatican officials have said that they hope to have a new Pope in place by Easter. "I have come to the certainty that my strengths, due to an advanced age, are no longer suited to an adequate exercise of the Petrine ministry. The Petrine ministry is the Vatican's official description of the office of the pontiff. However, in today's world, subject to so many rapid changes and shaken by questions of deep relevance for the life of faith, in order to govern the bark of Saint Peter and proclaim the Gospel, both strength of mind and body are necessary, strength which in the last few months, has deteriorated in me to the extent that I have had to recognize my incapacity to adequately fulfill the ministry entrusted to me."